Ice is nice and all, but if you really want to make a splash add some flavor to that frozen water. 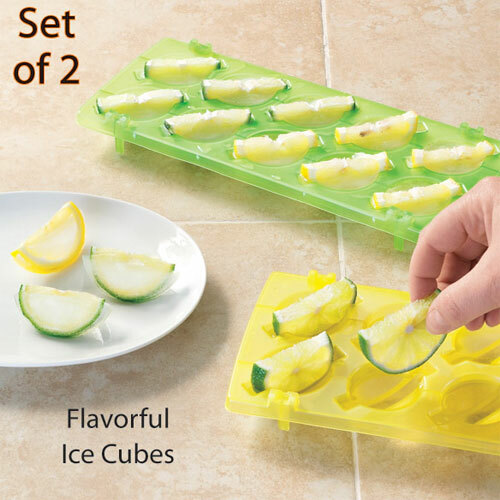 The Lemon/Lime Ice Cube Trays come in a set of two and are specifically-designed to turn regular lemon and lime slices into flavor-bursting ice cubes. Just place the citrus slices into the trays and fill with water. The ice freezes around the lemon and lime wedges, creating a fun and easy way to add flavor to cool summer beverages–even lemonade. Or perhaps, especially lemonade, considering every drink will pack that refreshing pucker-punch.